Join our three man balloon squad! Swear to protect balloons everywhere! We discuss everything and anything you like! It all started with a Roleplay. CD-Man and Sugar Lips were both fans of a series of games known as Persona. Looking to have some fun with some fellow KHI members, they both decided to join a new promising Roleplay called Persona: Frozen. This was to be the kickstarter to a much bigger friendship down the road. Max had never Roleplayed before, but the idea always seemed pretty fun to him. Becoming part of a story written by quite a number of people and never knowing what was going to happen next just sounded so exciting. While sifting through KHI's Roleplays, he found the majority either seemed to end up inactive, or were about Kingdom Hearts, go figure. Not that he didn't like Kingdom Hearts, but he just wanted something different. He eventually settled on Persona: Frozen. Persona was a great series and the Roleplay sounded fascinating, so he gave it a good long read. It was after this that he decided to join. And it was after he joined that he met CD-Man and Sugar Lips. Over the next few months, the three eventually began conversing, trying to get to know some of their fellow Roleplayers. They shared stories about their lives, discovered common interests, and had a great many laughs. A couple went on to Roleplay with each other in other stories, while others continued posting and having discussions in some of the same threads. Being the good friends they had all become and sharing interests in writing and reading, they began reading though each others other writings. One in particular led them to share many great adventures: CD-Man's Animal Crossing Delux. It was an interesting new look at the world of Animal Crossing, and it really caught Sugar Lips and Max's attention. Reading through the slice of life coming-of-age story about a boy named Casper spawned many jokes and even more laughs between the three. More-so, it resparked an interest in them to revisit the game they had all played in their younger days. 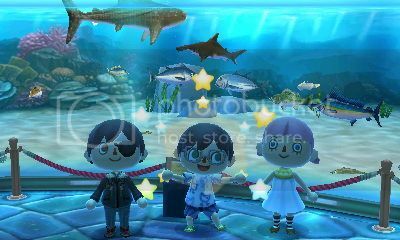 The three eventually found themselves playing Animal Crossing New Leaf. They scheduled meeting times to play together and began their great many adventures. They included raising money for a lighthouse, digging for treasure, fishing, taking pictures, and digging for treasure. Lots of treasure. It was during these times that the three could talk about anything and everything, and they became even closer. All of this eventually led to where we are now. The idea of a club came about. 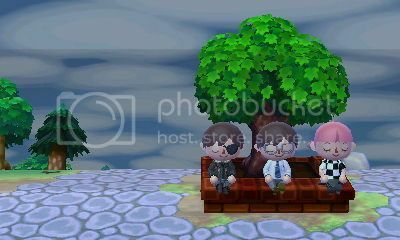 A club on KHI where all of their friends could come together with them and relax, have a good time, and feel free to talk about anything their hearts desired, just like the three did when they sat down and played Animal Crossing together. Fine Print: We're not responsible for falling into pitfall seeds, nets hitting the top of your head and Anna visiting your town. Join at your own risk and have fun. Whoo, I'm stoked to see this happening! Don't be shy people, we won't bite! Jumping right in to the topic of the week, when I was a kid I had a nasty scare with the first Animal Crossing game. I was stupid, so I often did stupid things. This including messing around with the memory card options in-game. There was an option to delete the save data, and I was curious about how the game told you about the consequences (an in-game neighbor served as your guide in the opening options) so I decided to click on it. When it asked me if I was sure, I expected the first option your cursor landed on to be "yes" so I tapped the control stick to the left and pressed A. To my horror, the game had been considerate and had "No" be the first option. My saddened animal neighbor informed me that she will start deleting the game data as the disc began to audibly whirl, and in a sudden moment of fear I jumped from my seat and pressed the Off button on my console. 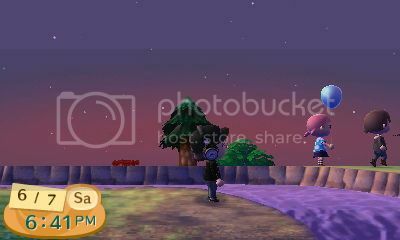 When I restarted the game, I was relieved to see my town was perfectly safe. Needless to say, I stopped being so curious after that. This club has been a long time coming, here's to all of us having an awesome time together! I guess I'll take CD's queue, and I'll respond to our topics of the week as well. Saving and Losing Data: So as many of my friends know, I have been a Playstation fan through and through for most of my life. I'm a huge trophy hunter, as you can see from my profile in my signature. So, I was taking on one of my biggest challenges yet: Getting the Platinum trophy on Blazblue Calamity Trigger. After many, many hours online and pushing my way through almost every character trophy, I just needed to complete Score Attack Mode. SAM is harder than Hell difficulty, unforgiving, only completed by the most skilled of players! But I was determined, this was the one trophy keeping me from my plat. So I played and I played, I perfected my fighting style as Ragna the Bloodedge and I worked my way up to the final fight after hours upon hours over the course of many days of trying to complete this challenge. Finally, I was in the clear. I had about half of my health left, and my opponent was only a hit away from death. We rushed to each other and just as I struck the final blow- the power went out. Yep. I broke my controller. I've never really been a controller slammer, if it gets that bad then I just stop playing for a while, but not on this day. So, after a while our power came back on and the weather and everything was looking fine, so I got my other controller and decided to try again. This time I breezed through the opening fights, having to restart only once. When I finally made it to that final battle again, it was time. The announcer began her usual: "The Wheel of Fate is Turning! Rebel 1... Action!" Right as we began to advance toward each other- the power went out again. It wasn't meant to be, at least not that night. I came back to it the next day and I raped the Score Attack Mode, which finally earned me my platinum trophy. The moral of the story: Persevere. Random Fact About Myself: When I was in high school, I joined our school's singing group. It wasn't the choir, it was supposed to be what was considered the step above, although most of the guys (including myself), didn't have much talent singing. Basically, as long as we weren't God-awful and we were strong enough to lift the girls, then we were in. I initially joined for a girl who was begging me to try out (which I would normally advise against, it didn't pan out with her anyway), but in the end I made quite a few good friends in there and we had an overall good time. We probably ended up being one of the oddest high school singing groups too, because many of us just weren't really the type you'd consider to do something like that. I ended up performing in two of the school's Cabarets, and I did a trio adaptation of The Who's Behind Blue Eyes, as well as a solo verse in Green Day's 21 Guns. I'm late! I'm late! Oh dear, oh my! It'll be off with my head! Don't be afraid to join us. Random Fact About Myself: I'm sure a few of you already know, I have a habit of breaking ear buds. I've gone through 10+ ear buds and 3+ headphones. I listen to music almost 24/7 and its a wonder how I can still hear anything as well as I do; I'm always the first to hear a car drive up and its passenger doors slam shut. Haha already drifting from the topic at hand. Anyhow, my headphones have a habit of catching on things, while my ear buds would always be crushed from being forced into my jean pockets. Or they end up being lazily swung around for my amusement. And then there was this one time, I went to wash a pair of ear buds off after getting them dirty. Not my brightest moment. Of course, the result made them worse and they were trashed within minutes. I have yet to find a pair of ear buds that can last me a whole year without breaking and endure my rough treatment of them. The funny thing is, I have a pair of white headphones that were broke but, still end up working after all of this time. Lesson to be learned: Take better care of your ear buds and headphones if you want them to last you a long time. I just finished working out for the day, and I am freaking jello. At least I've been able to keep up with it though, I had went a long time without doing much so it's good to kind of be on a schedule. I also watched 22 Jump Street today, which was hilarious! Tons of references to tons of things, it was pretty great. Anyone else see it/plan to see it? I really should start working out again soon too. I think I mentioned to Max that I was running on a treadmill every morning, but that was a long time ago and I haven't been keeping up. Something random about myself: I've started to realize recently that I might have low self esteem. Not dangerously low levels, but I think I tend to underestimate myself. I was talking to a coworker a while ago and he mentioned how little credit I give myself (I don't consider myself a 'good' worker, just a 'worker'), and I think this also bleeds a bit into my everyday life. From my appearance ("I'm not ugly, but I'm not handsome either) to my writing ("This isn't my best work" seems to be my go-to statement) and everything in-between. You gots ta give yourself some perspective sometimes, ya'll. @Princess Sugar Cookie: It's the new one, and it was awesome! So freaking funny. It makes me want to try the original tv series with Johnny Depp (even if it was more serious). @Both: I'm tellin' ya, this workin' out business is rough stuff, especially on days I work :/ I just don't feel like coming home and lifting dummbells after unloading trucks for 4 hours, or running on the treadmill after loading mulch outside all day. But I believe in the both of you! If I can do it, you can! I find that watching Malcolm in the Middle while working out diverts my attention from the burning sensation a bit longer than if I was just straight up working out haha. @CD: I think you may have a low self-esteem as well. Everything you write is always great, even your older work, yet you don't ever seem to think it's all that good (don't worry, I'm the same way). You also mentioned before that you didn't really know how to take compliments. While low self-esteem isn't really a good thing, it isn't the worst thing either. At least you aren't like "My writing is da best!" or "I can get any ho I wan'!" Instead you come off as a respectable gentleman that people want to eat tacos with. I think a lot of people like working out to music. I think the only reason I don't is because I mostly listen to a lot of the same stuff whenever I listen to music, which can start to get repetitive as opposed to a tv show with a different episode everytime. On another note, I started watching Golden Time today. It's an interesting anime about college students, an age not touched upon very often. So, I'm like, 80% sure KK is trying to make me break my wrist. lol, I think I'm alright though, for real. In other news, six thousand words hype! I can't say anything else, but expect something new soonish! edit: @music workout: Dude, music helps with everything. I remember I got my second wind because Pandora decided to play Asian Kung Fu Generation's Rewrite. It was a pretty sweet couple of running minutes. Dude, this mystery is becoming overwhelming to my soul, I don't know how much more I can take! Also, I think I'd get pretty pumped if Rewrite started playing as well, because that's just awesome (that was my first ringtone). It's pretty exciting, to be honest. Both CLASSIC and Simple Stuff are at roughly 6K words, so this new one has already caught up to them. It's also eaten up a lot of my time, which is why I haven't been updating either of the two in the past week. I'll try to get on that though. I just hope I'm not overwhelmed. In other other news: bread. ooh, you're writing something new! :O I can't wait to see what it is. Good to know we have similar tastes in music too. Rewrite is sooo good. I like After Dark done by them too. Take your time writing your stories out. :3 Bread? @Max: Music can be repetitive. Only I change my music on a daily basis, so it's not really an issue for me. xD I also don't like running on treadmills all that much and wonder how you can stand it. I prefer running outside. I need to find something to eat for lunch or I'll be starving till dinner time again. Man, I miss you guys. I feel like I haven't really talked to either of you in a while. @Sugar: After Dark is good too! Wow, we all do have uncanny similar interests! And I don't know, I think it's the humidity that comes with running outside and whatnot, I just really like running on treadmill. CD-Man will tell you all about the worst case scenario of running on a treadmill *winky* And I hope you found food! ...actually, no I haven't. I've just been lazy and listless and very very bored but I can't write because I don't have any motivation right now. Sorry, consider this a rare rant. edit: ignore that, we're writing a mile a minute over here! *cracks my neck* I've been busy lately. Having to keep my blog going and find mega stones. Luckily, I got the mega stones out of the way and updated a little of my blog. Except I'm behind on reading my books in order to keep it going. I also want to review this anime called, Black Bullet. Its really good and it'd make a good addition to my blog. I have side stuff to do, and I'll be busy over the weekend with groceries. ^>x<^ So kitty cat hasn't had a lot of free time lately, except for today with Legend of Zelda Wind Waker and still needs to keep her promise on updating her part in the Persona rp. Next week, I might hop back on the wagon of running outside. Need to get ahead of my to do list. Speaking of "To do lists" do either of you have one? @Max: Do you have any plans for the weekend? Pretty much, yeah hahaha. I should probably try to write a bit of my other stuff too, show them some love. I also have to set up Deluxe's finale. I have a few little details that need ironing out. I've been neglecting to post in our RPS as well, so I gotta get on top of that. Is this your first time playing Wind Waker, btw? It's probably one of the better Zeldas, at least in my opinion. Too bad the sailing can be a drag sometimes. Also, you write a blog? I didn't know that. I've been neglecting to post in our RPS as well, so I gotta get on top of that. I thought you had posted already? Oh wait, that was probably InnerPeace. xD So many things to do and so little time. Nice to know, I'm sharing a boat with you in regards to that. lol. Nope. It'd be my second time around playing Wind Waker after so many years on the Wii U. I'm on Hero mode and it is a toughie. :d I don't mind the sailing and happen to enjoy that aspect of the game. xD I agree it is one of the better Zeldas to date. I still love Ocarina of Time and Twilight Princess the most though. You know what guys, I've been busy too :/ Summer class work plus the fact that I picked up around 8 extra hours at work each week has been slowing me down a bit. @Sugar: Plans for the weekend? Work, and the finale of AC Delux! Also the Californication series finale, sad face. No Game of Thrones unfortunately. Also, I didn't know you blogged either. Caaann I reeaaadd it? @CD-Man: Looking forward to the finale, then finally... you know! Also looking forward to your RP posts. LatinoHeat asked me the other day if we should just move on or not and I just told him to wait a bit haha.